Industry Experts has today unveiled the new market research report on Fluorinated Ethylene Propylene (FEP). 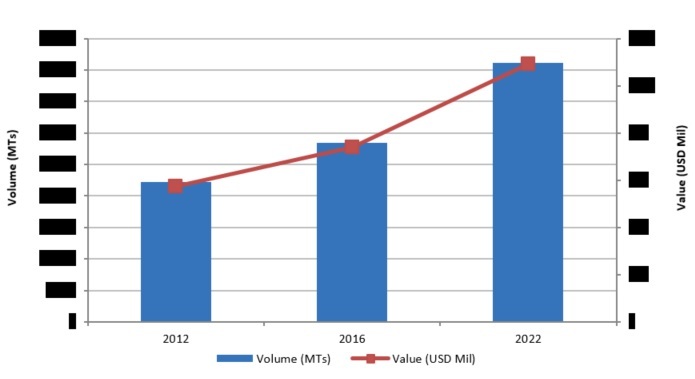 According to the new report ‘Fluorinated Ethylene Propylene (FEP) – A Global Market Overview’, North America leads the global market for FEP, forecast at US$353.1 million (47.7% share) in 2016, which is projected to reach US$494.1 million by 2022 at a CAGR of 5.8% between 2016 and 2022. The Electrical & Electronics sector dominates the global volume market for FEP, Forecast to be 17.4 thousand metric tons in 2016, global volume consumption of FEP in the Electrical & Electronics sector is anticipated to register the fastest CAGR of 6.7% between 2016 and 2022 and reach a projected 25.7 thousand metric tons by 2022. Fluorinated Ethylene Propylene is a copolymer of hexafluoropropylene (HFP) and tetrafluoroethylene (TFE) and is a melt-processable fluoropolymer. Being very similar in composition to PTFE (polytetrafluoroethylene), Fluorinated Ethylene Propylene is bestowed with the beneficial properties of low friction and non-reactivity that are hallmarks of PTFE. The only exception is that Fluorinated Ethylene Propylene is softer than PTFE and has a lower melting point of 260°C, in addition to being highly transparent and resistant to sunlight. Global demand for fluoropolymers has been witnessing considerable growth and as major worldwide economies are on the path to recovery, the need for specialty, melt-processable grades such as Fluorinated Ethylene Propylene has also been growing rapidly. This polymer is finding extensive use in areas such as wire and cable, photovoltaic (PV), aerospace and automotive markets. The report reviews, analyses and projects the Fluorinated Ethylene Propylene market for the period 2012-2022 globally and the regional markets including North America, Europe, Asia-Pacific and Rest of World. The regional markets further analyzed for 12 independent countries across North America – The United States, Canada and Mexico; Europe – France, Germany, Italy, Russia and the United Kingdom; and Asia-Pacific – China, Japan, India and South Korea. Global volume consumption of Fluorinated Ethylene Propylene, standing at 22.2 thousand metric tons in 2012, is forecast to be 28.4 thousand metric tons in 2016 and is projected to reach 41.1 thousand metric tons by 2022 at a CAGR of 6.4% between 2016 and 2022. Over the same period, value demand for FEP is likely to register a faster CAGR of 6.7% and reach a projected US$1.1 billion by 2022 from a forecast US$740.2 million in 2016. The global Fluorinated Ethylene Propylene market report analyzes the key end-use sectors comprising Chemical Processing, Electricals & Electronics, Mechanical/Industrial, Automotive & Transportation and Other Sectors including such as Medical etc. The global markets for the above mentioned end-use sectors are analyzed in terms of volume in metric tons and value in USD. This 194 page global Fluorinated Ethylene Propylene market report includes 146 charts (includes a data table and graphical representation for each chart), supported with meaningful and easy to understand graphical presentation, of market numbers. This report profiles 6 key global players and 14 major players across North America – 3; Europe – 3; and Asia-Pacific – 8. The research also provides the listing of the companies engaged in manufacturing, processing and compounding of Fluorinated Ethylene Propylene. The global list of companies covers the address, contact numbers and the website addresses of 92 companies.